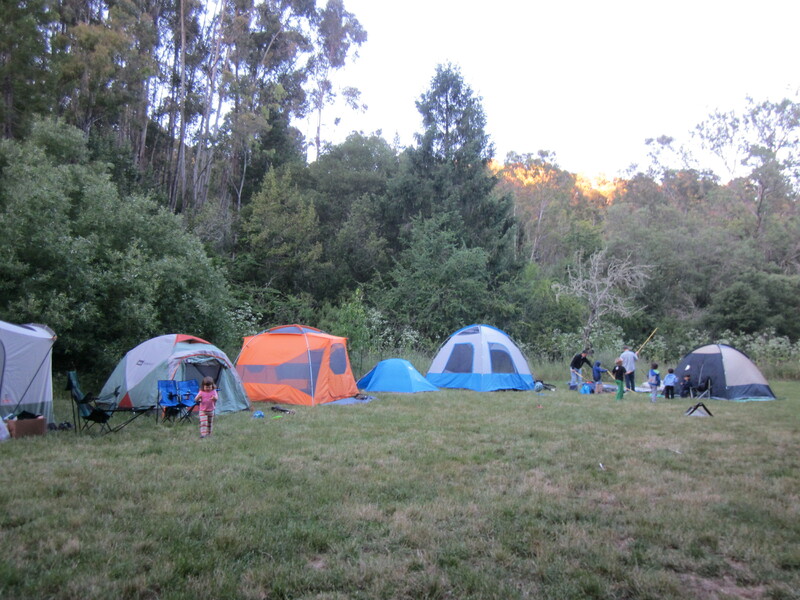 A week ago we headed to Redwood Regional Park with a group of families from our son’s school on a camping trip. I had ambitions, initially, of trying to cargo bike into the campsite. Anyone who knows anything about the Oakland hills is now laughing. The trip to Redwood goes up steep hills on roads with names like “Snake” which are meant to evoke the serpentine path they follow up a hill so steep that attempting to scale it even in a motorized vehicle involves a nauseating number of switchbacks. Redwood Regional Park’s gates are at the ridge, and from there the way in is basically straight downhill in the other direction. The paths down into the park, although portions can be ridden or driven, are not only extremely steep but deeply rutted and narrow. So yeah, we drove and walked in. Girls’ Camp is about a half-mile from the Skyline Gate, straight downhill. 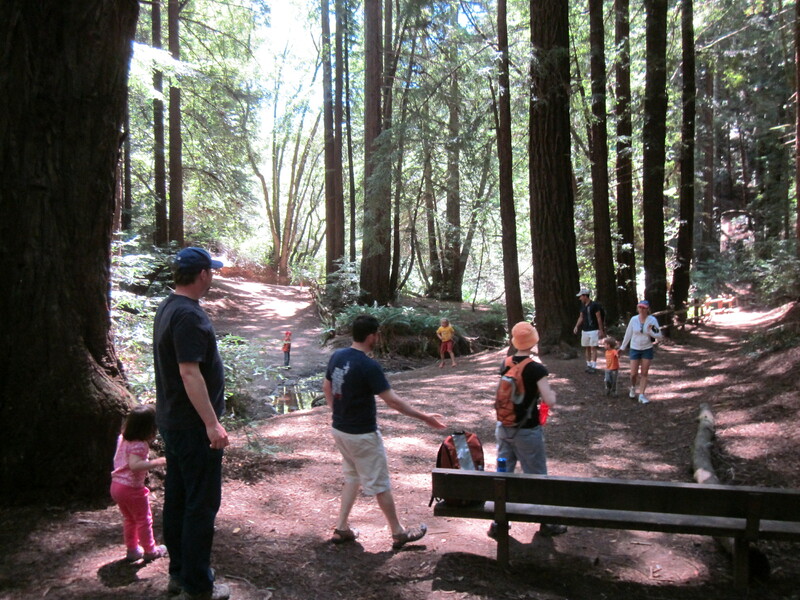 If you reserve the campsite, you get a code to open the padlock to the Stream Trail entrance. Only two cars are allowed to park overnight at the site, but by shuttling back and forth all of the families we camped with were able to portage down, empty out their gear, and then head back up to park at Skyline Gate overnight (you also get overnight parking passes). The camp site itself can hold up to 75 people, and with 30 or so we were nowhere near this limit. 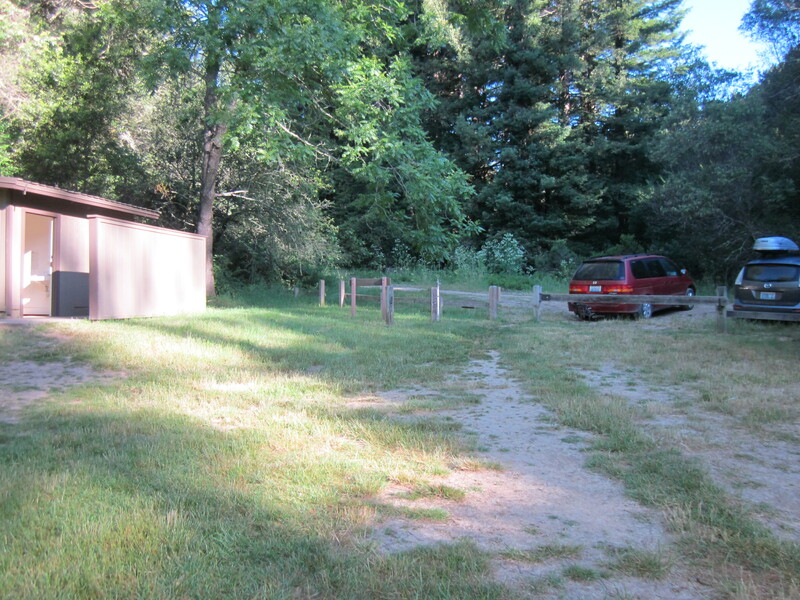 Girls’ Camp has a bathroom and cold running water, as well as tables, benches, and grills. Next to the firepit at the far end there is a shelter that the kids used as a stage and a place to run around. This site is in the middle of a well-traveled trail, but by evening anyone not camping is gone, and we had the park to ourselves. The site itself is beautiful, and Oakland parks are almost completely free of bugs other than yellow jackets (which stung two kids over the weekend, but I think this is atypical). 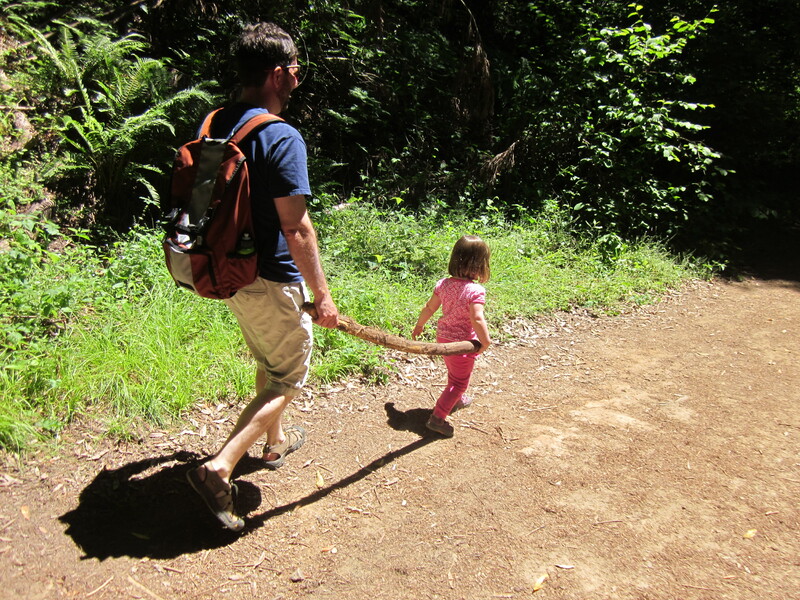 We hadn’t been camping with our two kids before and this was a great introduction. They spent the first few hours checking out all of the tents and spotting bunnies in the woods. The tombstone family had brought a badminton/volleyball net and for much of our stay the older boys played these two games simultaneously. 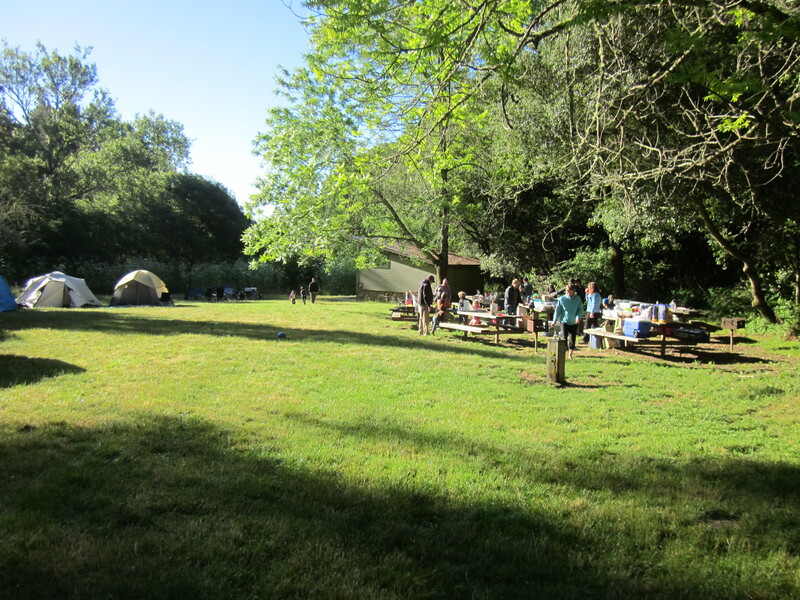 One of our friends is the Martha Stewart of family camping and had stopped at the Civic Center farmers’ market, where she had picked up, among other things, four dozen free-range organic eggs for $12. I had always shunned the Civic Center market because of its historic live-chicken-slaughtering reputation, but apparently the city cracked down on that and now the Heart of the City market is the place to shop. At any rate we all ate well. The first night the kids spent hours making s’mores which in the case of our kids may well have been the peak experience of their lives to date. We had planned to stay two nights, but learned on the first night that our daughter is still too young for overnight camping. For two hours straight after bedtime she was so amped up she was yelling randomly, “I have a bike! I saw a bee! Stop bothering me! I need to sleep! Did you see the bunny! I saw a bee! Stop bothering me!” Of course she was up at the crack of dawn. Our only consolation was that the other three year old held his two-hour screaming fest at midnight, making us only the second-most obnoxious family at Girls’ Camp. So on the second day we hiked the Stream Trail out and back, which was beautiful. We returned to head further into the park to the Roberts swimming pool, and deciding to quit while we were ahead, packed up after dinner and headed home. Both kids slept like the dead in the house, thankfully, although our son turned up in our bed and did his level best to shove both of us out of it. We still had a great time. 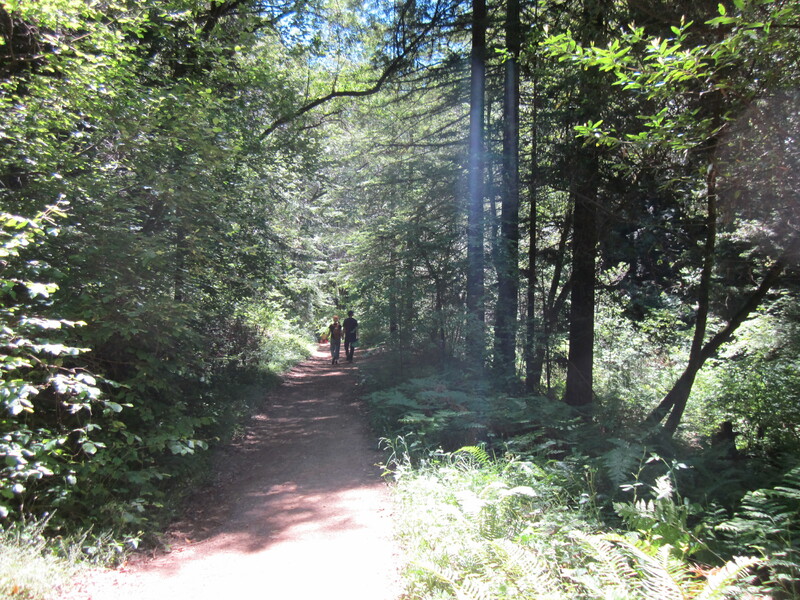 It is, evidently possible to ride bikes in Redwood, although not to ride them the way we do. One family had brought mountain bikes and took a side trip; mom drove them uphill to the start of the trail and then drove downhill to wait for them at the end. There is so much gender politics wrapped up in that story I can’t hope to unpack it all. But it struck me as the mirror image of much of bike commuting in the United States. Mom is the sag wagon. If people couldn’t rely on that free ride, how different would bicycling be? Sometime, when our kids are older and our daughter might sleep through the night, we will try camping again. Although Redwood is beautiful, another possibility was the destination of another family in our group the next week: Angel Island. The only way onto Angel Island is by ferry, and only walkers and cyclists can ride the ferry. That would be a different kind of trip, but we had such a good time, we’d like to try it again once sleep is a real possibility. That looks so fun! We’ve only been camping 3 times since kids and each time only for one night. Still totally worth it! Hopefully next time will be bike camping. Our last trip was at Larrabee State Park and we drove through Bellingham on our way home–such a cute town! Our group campsite was right next to the train tracks upon which freight trains barreled by honking and bell ringing every two hours all night long. Some families stayed two nights (including rain the first night! ); I can’t even imagine! Angel Island sounds awesome! I can’t believe I’ve never been there. I remember watching neighbors drive off with bikes on the backs of their cars for day trips there. I guess they left the car at the ferry. Do it! I think future camping trips will be one night only. That’s about how much sleep I can imagine losing without going completely insane. I suppose if we’re not sleeping anyway being next to the train tracks is a moot point–maybe that was your friends’ logic? My sister is actually heading to Bellingham today, and she got a rental bike for her stay; she’s thrilled. We’ve done Angel Island as a day trip and it’s great, but I’ll need more practice before I feel comfortable handling an overnight camping trip! My folks live near Redwood Regional Park. I love it there and had many great runs through the trails circa 2001. Trail biking would be ideal for seeing the park, since you can travel much further– there’s a lot to see! It’s not technical, but you have to be a decent climber. SF bikers shouldn’t have a problem. I think our biggest problem would be our bikes–the Kona could probably handle the rutted trails we saw, but our other bikes are all citified and wussy. I agree that it would be a nice ride, although I wouldn’t want to get through the Oakland hills to the park itself without some kind of motorized assistance! Thanks for the post. 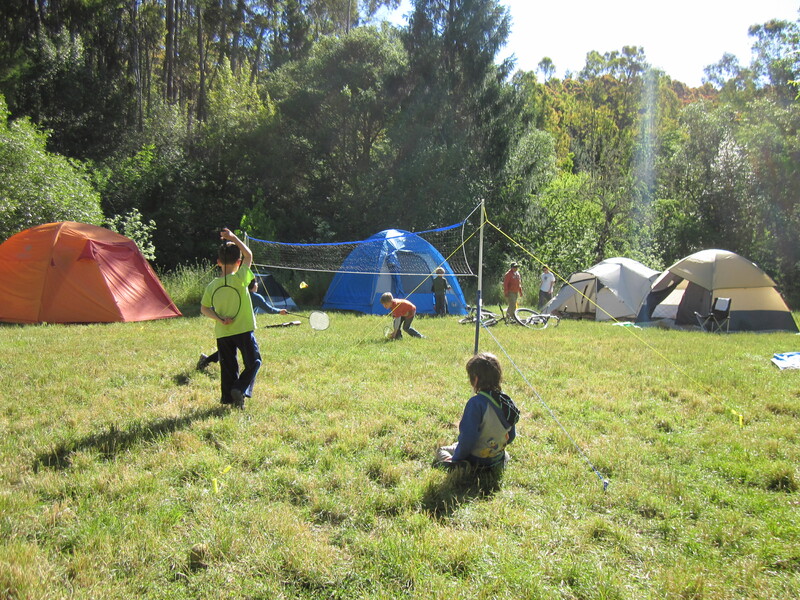 We’re planning a stay at Girls’ Camp next month, and appreciate the logistical info about the site.